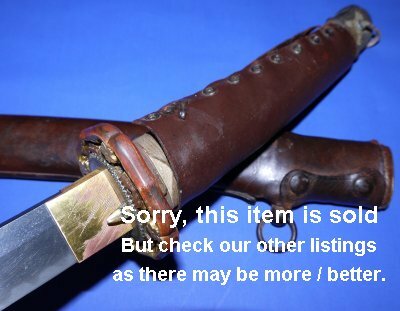 In overall good but aged condition, a WW2 Japanese Army Officer's Shin Gunto in full leather combat covers, with Gendaito characteristics and some history. 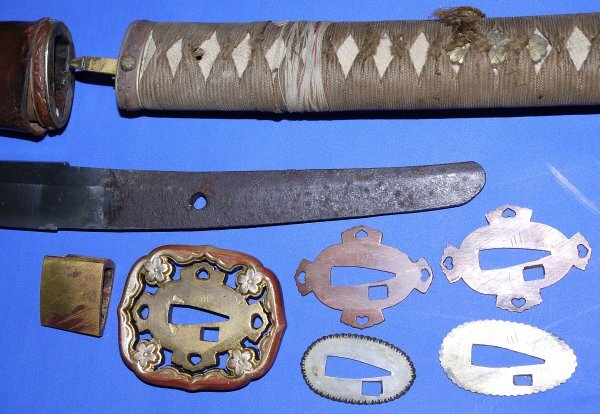 This is one of two shin guntos bought back from Burma by Rifles officer Maj. John Campbell. 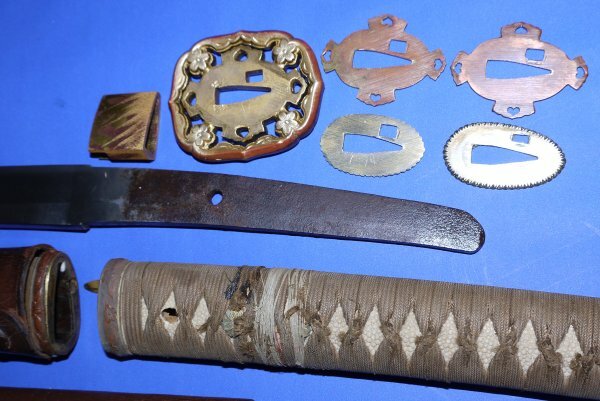 His family say one of them he took from a captured Japanese officer who was about to commit Seppuku (harikari) with his sword, but Major Campbell prevented it. The two swords came to the UK, were put in his attic and stayed there until his family cleared the home after his death. When we took the leather hilt cover off, the leather cord just disintegrated. We have enriched the covers with leather balsam and cleaned the fittings up a little. The blade is in such excellent condition because Major Campbell well and truly greased the blade. The unsigned blade has some distinct Gendaito qualities, but we can not guarantee it. There is a mon affixed to the pommel but the Japanese officer obliterated it to preserve some family honour. See the other sword here. 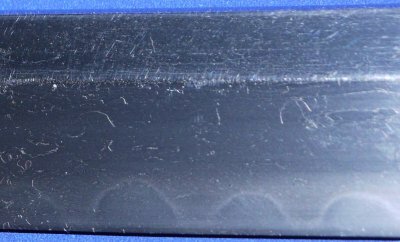 The 27 1/4 inch nagasa (cutting edge section) blade is in very good condition, with a couple of period nicks, and os firm in the hilt. 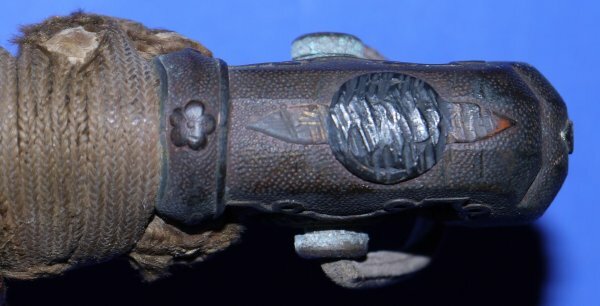 The hilt is good but the silk bindings are going in a couple of places; there is period silk thread around some of the hilt, so the wear is period and the Japanese officer clearly effected these repairs. The sword sheathes and draws very well and the locking mechanism works. The leather covered saya / scabbard is good. The tsuka (hilt) cover is not bad but the leather bindings are gone. Come on, what a great sword and with history. Grab it quick, £? (too late, now sold). Please quote item reference S47 (0655). Further / full sized images available upon request. NB: If required, we can point you to a refurbisher that can replace the grip bindings for under £100. But we very much like it the way it is. As for the leather combat grip cover tie cord, simple leather cord / laces is / are all that is required to replace the original. 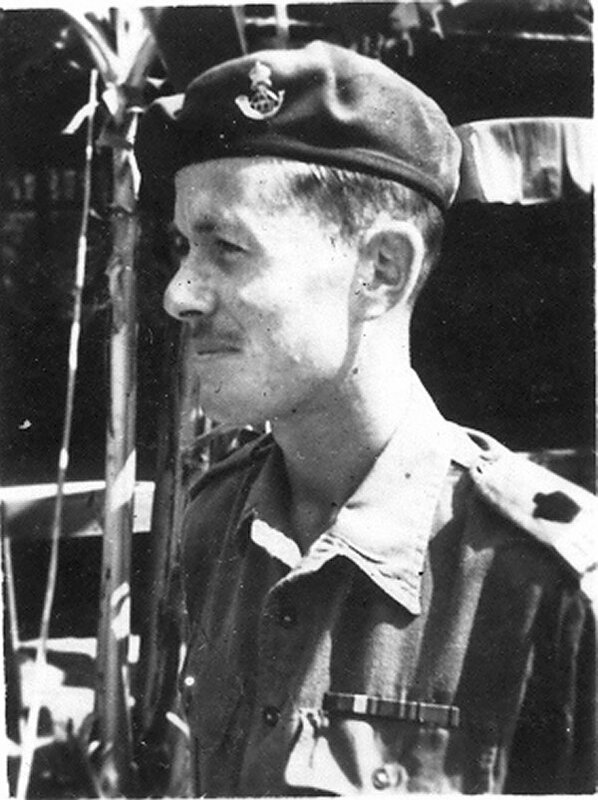 Below; Maj. John Campbell while serving in Burma.